The first Remembrance Day was held in 1919 throughout the Commonwealth. It was originally called “Armistice Day” to commemorate armistice agreement that ended the First World War. Every November 11th there is a two-minute silence at 11am for people to remember all those killed in the First World War and other conflicts since. Armistice Day was held on the Monday of the week which November 11th fell from 1921 to 1930. 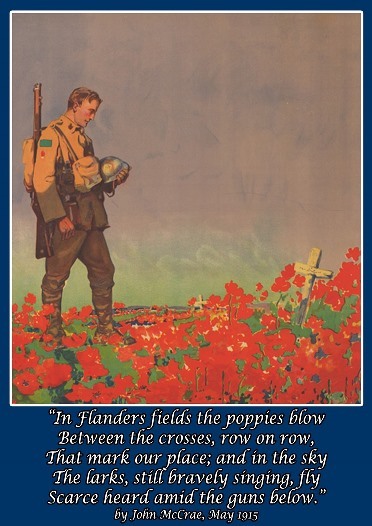 Member of Parliament for Comox-Alberni Mr Alan Neill introduced a bill to observe Armistice Day only on November 11th and a House of Commons bill changed the name to Remembrance Day, with the first Remembrance Day taking place on November 11th, 1931. • The Red Poppy was first created as a symbol of Remembrance by an American, Miss Moina Belle Michael a professor at the University of Georgia. She was inspired on 9th November, 1918 by the poem 'In Flanders Fields' by Canadian John McCrae, with its opening lines referring to the thousands of poppies that were the first flowers to grow in the churned-up earth of the battlefields and on soldiers' graves. She wrote a poem in response called “We Shall Keep the Faith” and vowed to always wear a red poppy as a symbol of Remembrance for those who served in the war. Moina Michael threw her efforts into campaigning to get the poppy adopted as a national Remembrance symbol. Two years later, the National American Legion's conference proclaimed the poppy as such. Among those at the conference was Madame Anna E Guérin, of France, who saw poppy sales as a way of raising money for the benefit of the French people, especially the orphaned children, who were suffering as a result of the war. Having organised the sale of millions of poppies made by French widows in the United States, in 1921 she sent her poppy sellers to London. Field Marshall Douglas Haig, a senior commander during WWI and a founder of Earl Haig's British Legion Appeal Fund (later The Royal British Legion), was sold on the idea (as were veterans' groups in the Commonwealth). So, in 1921, the newly-established legion sold its first Remembrance poppies. And so the tradition began. • Moina Belle Michael became known as “The Poppy Lady” through her campaigning for the Memorial Poppy. • Although the Poppy Appeal has its origins in World War I, where it became a symbol of Remembrance and hope, it is still just as relevant today. That's because the money raised goes towards looking after serving and ex-servicemen and women, and their dependants who are in need - financially or otherwise. • Selling poppies proved so popular that in 1922 the British Legion founded a factory - staffed by disabled ex-servicemen - to produce its own. Today over 45 million poppies a year are crafted, in an operation involving just 40 full-time employees - many of whom are disabled ex-servicemen. • The poppy may be worn at commemorative events throughout the year, such as anniversaries of significant battles, a memorial service, and other similar occasions. • The Legion suggests that the poppy is worn on the left lapel of a garment and as close to the heart as possible. • The Queen lays the first wreath during the national ceremony at the Cenotaph in Whitehall. • Other charities sell poppies in different colours, each with their own meaning but all to commemorate the losses of war. White poppies, for example, symbolise peace without violence and purple poppies are worn to honour animals killed in conflict.